The left column is the native rending. This screengrab was taken on an Android device, as perhaps you can tell. iOS, Android, Windows 8 and (I’m told) OS X Mountain Lion display Emoji natively, regardless of typeface. It seems that unprintable characters fall back to some kind of system fonts to display them. But if the large amount of older desktop systems don’t have this feature, what are we to do on the Web if we want to display – for example – a tweet full of pictograms? As they’re standardized code points it should be a cinch to display any text containing Emoji. All we have to do in our HTML layer is perform some simple string manipulation and replace the unprintable characters with the funky little images. All we need then is 900+ artworks with a permissive copyright license. :-? I started looking for Emoji assets we can use outside of proprietary operating systems and found various projects. The most comprehensive seems to be Github’s Gemoji project. All the iOS icons are neatly cut out as 64px PNGs and named according to their Unicode code point, plus a human-readable alias. Great, so we can use these in our apps and display tweets properly, right? Well, I’m not sure. They are copyright of Apple, so it seems unlikely that we can. I failed to find any decent information about the licensing of these artworks, so I can only assume that you cannot copy or distribute them. Sending a tweet with an Emoji in it is not copying the artwork any more than these words I’m typing are copying the Arial typeface. Licensing aside, the above is a fine set of images. Exporting them as a sprite created a fairly large file and obviously the images don’t scale too well. Looking around for an open source font with Emoji characters, I found Symbola – a Unicode font for ancient scripts. Kudos to George Douros who has not [yet] licensed it. 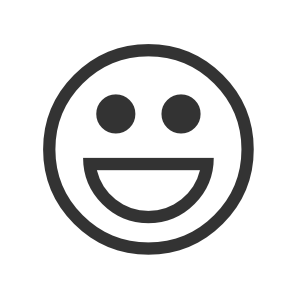 It provides some very decent monochrome versions of the Smileys and more. UPDATE: Since contacting the author of Symbola about the absence of its license (and receiving quite a rude reply) I’ve discovered that at least some of the pictograph glyphs are copied from the Unicode charts. Copyright is not attributed to anyone specific which makes it rather difficult to request permission to extract and use the mysterious Uni1F600Emoticons and Uni2600MiscSymbols font subsets. The Android project also includes an Emoji Font which is licensed under the Apache License. It is missing some characters not supported on Android though. This seems like the best polyfill available for rending scalable Emojis on systems with no Emoji fonts, and doing it legally. However, your web browser won’t fall back to this font when a character isn’t printable. We still have to do some string manipulation and wrap Emoji sequences with something like: <span class="emoji"> </span> but without the extra hassle of identifying the specific character. I won’t go into the coding techniques right now, but might most about that later on. This Kickstarter project – Phantom Open Emoji – is pledging to make a complete library of Emoji for anyone to use for free, without any licensing problems. They will be releasing the source SVG files too, so good luck to them. I hope it comes off. @Jeffery I’d love to add the Windows font, but Segoe UI requires a license. Of course I included the copyright Apple glyphs as images, but only because I saw that Github had already done it. Thanks for this post and the encoding table – useful stuff! 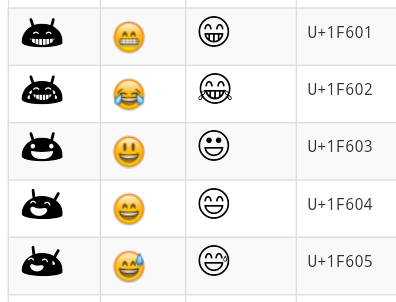 It might be helpful to include Segoe UI in the encoding, so that we can see how Windows 8 users see their Emojis.